I recently took part in a 5K race for the first time in my life. A year ago I would have never believed I could do that. The feeling of accomplishment when I crossed that finish line was amazing and addicting. I decided right then and there that I was going to do more of these races. I have since signed up for two additional races in the next two months. I want to see if I can beat my previous race time. I keep thinking of how great it would be if there was one place that would track my progress so that when I have completed 3 or 4 races, I could look at all of the results and compare them to each other. This would tell me instantly if I had improved or not. The best I can do right now is manually track the results. 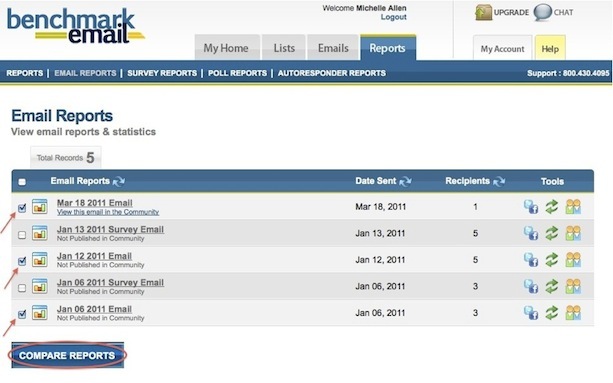 I’m going to look into a comparison site for my races, but lucky for you Benchmark Email has recognized the importance of doing side by side comparisons with Real-Time Campaign Reports. Once you have sent out a couple of campaigns, check out this great feature. Viewing the reports of campaigns simultaneously will help you to determine what works and doesn’t work among your subscribers. This information will help you to grow and continuously improve your success in email marketing. Here is how to access the feature. First, click on the Reports tab. It will bring you to the following page. You’ll need to click on the Compare Emails button, which I have circled in red for you. You will then be directed to this next page. This is where you will select which of your campaigns you would like to compare. I have selected a few of my own to demonstrate this. 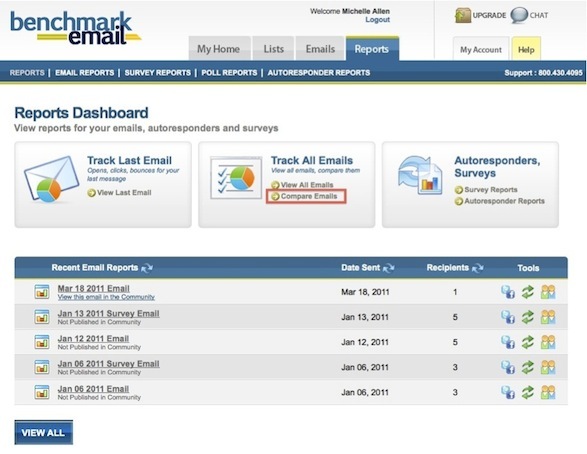 After making your selections, click the Compare Reports button underneath the Email Reports list. Now you will be able to see the data for all of the selected campaigns in a side by side graph. You can utilize the information to determine which email campaigns have had more success. We strongly encourage you to take advantage of this feature. Over time you will start to learn what makes your subscribers take action or not. This means a higher ROI and a more enjoyable experience for everyone involved. Are You Overlooking Critical Engagement Metrics?